milspouse appreciation: all the cool kids are doing it. Happy Milspouse Appreciation Day! If you are a milspouse, you are part of one of the coolest “cool kid” clubs in the world and for that you deserve lots of recognition, praise and, most of all, appreciation! So in case you aren’t hearing it enough, I would like you to know that I appreciate you and the sacrifices you are continually making for our country, for your marriage and for your family. I admire you, I look up to you and I and proud to call so many of you my friends. Also, I think you are very intelligent and beautiful and strong and funny and witty and patient and good at everything you do! I met my soldier, Andrew, almost seven years ago, when he was just starting his Yuk Year at West Point and I was a sophomore at Marist College. Two years ago, we made it Facebook-offish and said “I do,” in true mil-fashion: first in a Colorado Springs courthouse and, six months later, in a church on Long Island. Three months after our “real” wedding, Andy deployed to Iraq for a year (which was when and why I started this blog). We spent three years in Fort Carson, CO and just moved to Fort Benning, GA. We have two pups: Lily the Goldendoodle and Hudson the German Shepherd aka Lily & Hudsie. I am 7 months pregnant with our first child, and, because we are just that patriotic, she is due on the Fourth of July! I am new to stay-at-home-momhood, but, right now (pre-baby), I enjoy filling my time with cooking, baking, photography, crafting, organizing, music and social media. You can find me on Facebook, Pinterest (LOVE! ), Instagram (alliegirl428) and sometimes even Twitter. 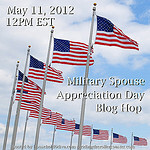 Many thanks to a couple of really cool milspouses, Ann Marie and RC, for organizing the MilSpouse Appreciation Day Blog Hop today! I can’t wait to hop around and meet some more card-carrying (DD 1173) club members! Hello! I am stopping by from the blog-hop. We just left Fort Benning earlier this year and strangely enough, I miss it. Thanks for visiting! I do like Benning for it’s lush greenery, but the bugs and humidity are sort of getting the best of me… (already). LOVE that you’re due on the 4th of July! You must have planned that out, huh? Look forward to reading more and I hope y’all are enjoying GA! Thanks for visiting, Jenn! Surprisingly, we didn’t purposely plan for the holiday! Just a lucky coincidence! Congratulations on your patriotic baby! I look forward to following your adventures in mommy hood, it truly is a great gift! Thanks, Alyssa! I’ll be getting mom-tips from you! LOL You are awesome!! Congrats on the baby hope all goes well. Happy Milspouse Appreciation Day!! Thanks very much! Excited to be following you back! 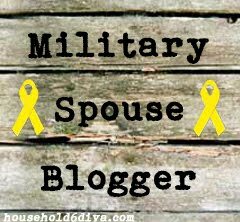 I’m visiting from the MilSpouse Blog Hop! Happy Military Spouse Appreciation Day to you! Eek! I love holiday due dates! My older son, Jagger, was due on Valentine’s Day and my younger son, Xander, was due on April Fool’s Day! How awesome to have a baby due on the 4th of July! Very patriotic! Thanks so much for visiting! Can’t wait to check out your blog, too! Thanks, Athena! And thanks for stopping by! Can’t wait to check out your blog this morning! Just stopping by from the blog hop! We are in CO right now, but getting ready to leave, and we came from Ft Benning before that. Congrats on the 4th of July Baby, maybe she will actually arrive that day! My oldest was due 9/9/99 but unfortunately showed up a whole month early. How cool would that birthday have been though?!? Happy Blog Hop! Lora- I hope you are loving CO! We definitely did and miss it tons! 9/9/99 would have been SO awesome for your babe! Really looking forward to checking out your blog, too! Thanks, Bethany! Can’t wait to hop over to your blog today, too (I ran out of time yesterday- so much time on the computer)! Congrats on your upcoming Baby and Happy MilSpouse Day to you!! Thank you so much, Marcella! Looking forward to hopping over to your blog this morning! Ooh! Yay! Wishing you tons of good luck and happiness! Thanks for visiting! Happy MilSpouse Appreciation Day!! It’s nice to “meet” you :). Thanks! You too! Love your blog! Oh my gosh, I hope you deliver on 4th of July. How cute is that?! It would be too perfect! I know the odds aren’t really in our favor, but a gal can hope! Sarah- so funny you said that. Andy has been saying we should name her America! It would be a little out of control patriotic, even for me! I so hope you’re able to deliver on the 4th! That would be awesome. Love your blog! Hey Jessica- Just started following you! Thanks for hopping over! Just stopping by from the blog hop to say hello! I hope you had a great Military Spouse Appreciation Day! Congrats on your little bundle of joy! How great is that? Due on the 4th of July! Hey Kathryn- Thanks for hopping over. Just started following you back, and it looks like you’ve had your hands full! Hope Mother’s Day was a nice reminder of why you love being a mommy! Hi Heather! Likewise! I just hopped over to your blog (a little late) and started following you. Looking forward to hearing more from you! Thank you so much for joining in on the blog hop! And sorry it took me so long to come and visit. It was great reading your party post and getting to know you a little more. 🙂 Hope you had fun visiting the other ladies on the list and that you had a fabulous Mil Spouse Appreciation Day!!! The hop was a total success! No wonder it took you a while- you literally had hundreds to get to! 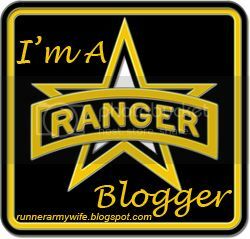 Thanks for giving me a way to find some new blogs and make some new friends! I had a great time! Thanks, Amanda! Nice to meet you, too! Can’t wait to check out your blog, as well!